New courses provide UCSC students with the opportunity to explore exciting aspects of the history of Jewish cultures. In 2010, Paula Daccarett joined the UC Santa Cruz Jewish Studies department as a visiting assistant professor, thanks to a grant from the Foundation for Jewish Culture/Jim Joseph Foundation. Born and raised in Colombia and educated at the Hebrew University of Jerusalem and Brandeis University, Professor Daccarett’s relationship with Jewish Studies began in graduate school. While at UC Santa Cruz, Daccarett is presenting the first purely historical look at modern Jewry in Latin America in her course “Modern Jewish History in Latin America” (History 185I). 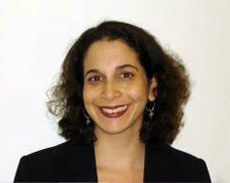 This academic year, Daccarett will be teaching her course on Latin American Jewish History in the Fall quarter 2011. Also offered by Daccarett this upcoming school year will be “The Modern Jewish Experience” (History 185J) in Winter quarter 2012 and “Women, Gender and Jewish Modernity, 1800-Present” (History 185H) in Spring quarter 2012.